I see this gentleman often at Pitti and he is always beautifully dressed. I love the sleeve length, pant length and overall fit of the jacket. The slimness of the jacket and pants actually creates a lengthening effect. I would maybe try a slightly more narrow tie and smaller collar on the shirt but that is personal choice. Notice the upper sleeve, over biceps, section of his jacket - I always try to get that sleeve section a slight bit more narrow. It really finishes off the overall long, slimming effect of a slim cut suit. Look at Astaire, his sleeves in that section are always very narrow. It is a very small detail but one that always stands out to me when I watch Astaire movies. To the opposite effect, if you are narrow this is a good spot to create a wider visual. Comments on "On The Street........That Fan, Florence"
Can anyone say "Karl Lagerfeld"? As opposed to the previous post "On The Street.........Those Shoes, Florence " in this case this gentleman is really very elegant; indeed the restraint is used here and only one smart detail such as the contrast collar shirt is present. 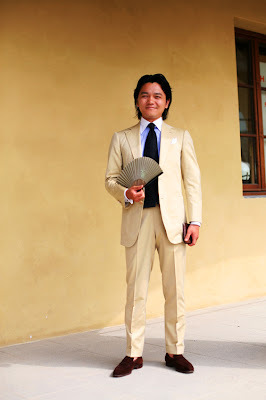 The remaining portion of the outfit is very sober( matching cream, blue and brown colours) and the suit has a splendid cut that comes very likely from a neapolitan tailor (see the high notch lapels , the very natural shoulders , the high armholes and the slim fit of the trousers).This gentleman knows how to be elegant but sometimes seems to forget to right way beeing too much overstated. This suit looks better than the previous one,but it the proportions are still a mix.The jacket is too long for him.He simply looks over dressed. I am like you ... I prefer smaller collar tie reverse of pants also ! Nice shoes ! Bravo! This is a much more flattering choice for the gentleman than the db, in my opinion. The trousers (and jacket sleeves) are cut just so - maximizing elongation for a figure of short stature. I would add that shortening the waist and the length of the jacket about two inches or so would shift the visual centre of gravity upward, another Fred Astaire trick that adds attenuated elegance. In Japan, men do not coordinate their fans with their clothing, but rather choose subtle colours and patterns as demonstrated here. But wouldn't it have been fun to have created some tonal relationship between the shirt/tie combo and that dashing cross-cultured accessory? i agree with the length of the pants, this is how i want my pants! I might actually take this pic with me when i pay a visit at the tailor. Like the suit, even if the jacket is a mite long for him. And I'm liking more and more (do my eyes deceive me here?) the wide pants cuffs--that finishes them/ tells onlookers that the trousers are MEANT to be shorter. This guy has got it down to a T. Perfect hair and attire. But on the collar and tie, I always go for a high collar stand with a little spread and a longer point and a nice thick and crispy tie (sounds a lot like fried chicken doesn't it?!!!). Very nice suit. I agree with you, Sart, the tie is a little wide. Beautiful shirt though, and those suede loafers are wonderful. It's not often that I see a fan used as a gentleman's accessory. Looks good and better then the DB. However i agree with the sartorialist in that the collar and the tie should be smaller and narrower. That would be a better proprtion since he has a rather large head. Also the jacket hem could be a little shorter and trousers a little looser to balance the upper half. that said, still very well done. keep it up! Yup, I knew he was "closet quirky." BTW, the wider tie provides a nice counter-balance to all the slimmed down tailoring. Sart, what's the heritage of this gentleman? In the previous related entry, some of those commenting wrote that this fellow was Japanese. As I recall, though, you haven't written anything about this gent's ethnicity. I am curious to know. Nice to read what you're seeing, Sart. But I still need another half an inch of pants length. This man has a ridiculous collection of amazing suits. I've been looking for a good double-breasted for a while, and of course his is fantastic. This suit isn't shabby either - but the fan is a little too affected for my taste. Another point for the men of indiscernible origin. A more colorful pocket square would set off the outfit a bit. The white one gets lost. He's an impeccable dresser no doubt. I've been thinking about carrying around a fan too, especially for when I'm outside in a stuffy tent. I wish I hadn't broken the ones I had when I was a little kid. I'm this man's fan. This fellow knows how to dress, and impress. Fine fabric, perfect cuffs, sleek silhouette. Most important, he clearly enjoys it all. Bravo. So chic and I love the mix of the well-tailored masculine suit with a 'feminine' hint of the fan, a stylish but also practical touch. What I love about European style is that they are often not as narrow in their thinking of what is masculine. More and more it seems American men are learning this as well. Sarto, your comments of the cut of the jacket is wonderful, I love how you notice those details. You are a one-man fashion revolution I hope our lovely American men continue to take note. whoa that is a big tie and collar! Karl Laerfeld is an ossified mummy compared to this man (or most humans). This gentleman looks happy and super stylish. Although his shoes reminds me of a certain Tod's loafer I like that is so elusive. Wonderful suit and a great overall outfit; I especially like the shoes, an elegant choice. While I think the shirt collar is fine, I agree about the tie. I somewhat overwhelms the shirt and jacket. Isn't this guy emulating Valentino? Even the shoes. Elegant anyway! He is like a character out of a Wes Anderson movie. The cut of the trousers in the db pinstripe suit is very classic 60's. The dark hair and again the dark shoes and in between the light colored suit plus pants kind of frames him and makes the man look even shorter than he already is.Maybe a shorter haircut would fit this outfit better. If he would wear jeans and some sort of casual shirt the long hair could be ok. I adore the fan. Like those drawings of samurai gentlemen -- a little lethal and quite elegant. wow. Must be one picky dresser. He looks real good though. Anyone who says otherwise has no sense of fashion and taste--yes, you euro haters. YES If you are an asian or amerindian man and you have these gorgeous blueblack straight hair!